Marantz announces new MusicLink CD player | What Hi-Fi? The £450 player is the latest entry to Marantz's MusicLink series, accompanying the HD-DAC1 headphone amplifier and the HD-AMP1 stereo amp. Marantz has unveiled its new HD-CD1 CD player, part of its MusicLink series. The design of the HD-CD1 is centred on the company's Hyper-Dynamic Amplifier Modules (HDAM) which, it says, provide "a wide dynamic range and wide frequency response" with the lowest possible distortion of MP3, WMA and AAC files, as well as standard CDs. The player has analogue as well as optical and coaxial digital outputs, so it can be connected to an amplifier or an external DAC such as that used in the HD-DAC1 or HD-AMP1. It also includes a standard 3.5mm headphone jack with a HDAM-SA2 amplifier featuring 'Low', 'Medium', and 'High' gain settings. According to the company, the HD-CD1 features the same Cirrus Logic CS4398 DAC found in top-flight digital hardware and is capable of handling a 24-bit/192kHz audio. The player also has a double-layer chassis that limits unwanted vibrations, and an auto-standby mode to reduce power consumption. 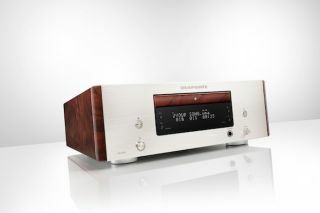 The Marantz HD-CD1 will be available from September, priced £450.